Casework Packaging - We can custom-fabricate foam packaging for any size case to protect for your fragile assemblies and equipment. Both blow-molded and injection-molded cases are available, in a variety of sizes and configurations. Fabricated Polyurethane - Available in a variety of densities, polyurethane-designed forms can protect the smallest of parts as a custom fabricated package. These style designs work very well in mailer and case applications. Polyurethane foam is open-celled and also available in anti-static form. Fabrication of EPS - Expandable polystyrene (EPS) is a lightweight foam which lends itself well to custom shapes. It can be fabricated into a myriad of forms, ranging from trays, to package inserts, to simple dunnage or filler. EPS foam is recyclable, has low heat conductance, provides constant insulation, and is a proven and tested protective packaging material. With a high R-value, EPS is very effective when temperature-controlled packaging is necessary. Fabricated Polyethylene - This closed-cell foam is available in a range of densities and other properties depending on the customer's needs. One particular, common use for polyethylene is to fabricate foam endcaps to help immobilize and protect your product in shipments. Fabricated polyethylene inserts or trays are also common. Densities range from 1.2# to 4.0# for most custom packaging work, and 6.0# and 9.0# are available for when only the most rigid foams will do for extreme load-bearing. Hinged Polyethylene Foam - A custom-designed style of polyethylene plank. Any density polyethylene can be laminated with an 1/8" layer of high density PE. Special tools are then built to allow kiss-cut of the foam, enabling a "hinge-style" form, that can contain the protective runners within the shape and eliminate the need for glue. Eliminating glue allows polyethylene to stay "green" and can be recycled at an appropriate facility. Furthermore, it often lends itself to better storage. Fabricated Corrugated - In addition to custom cartons, we can fabricate corrugated sheets or boxes in conjunction with various foams, or whatever else may be required. Anti-static Mailers - We can custom design anti-static bags, envelopes, boxes and other types of packaging to ensure your sensitive product arrives safely at its destination. Foam Profiles - Nomaco foam profiles are excellent for edge, corner or total protection for items such as furniture, tubs, showers, appliances and more. 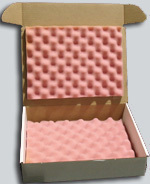 We can customize Nomaco foam packaging for your unique application; to protect your goods from shock, vibration, breakage and scratches.